Shelving Concepts - Try our new Design A Warehouse tool! Design your own warehouse online with the Shelving Concepts user friendly DesignAWarehouse.com interactive warehouse building tool. Simply type in warehouse room dimensions and your room will appear. You will then have the ability to drag and drop the corners of the room to change the dimensions and/or shape of the room. All the icons start with standard sizes however most of the products can be made in any size by clicking on the icon you can type in the dimension you need. You also have the ability to drag the corners of each of the above icons to change the size or double click and drag to move the elements. Then if you choose, you can Print, Save as PDF, and/or save as JPEG!! 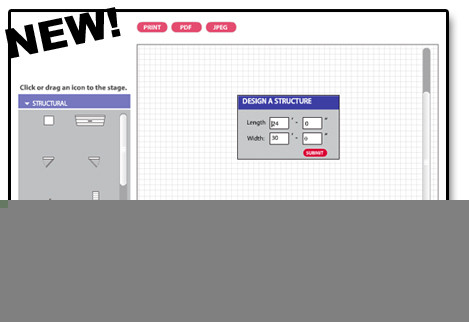 Have fun in the Shelving Concepts DesignAWarehouse.com interactive tool center! We appreciate your business and any feedback! Need More Information? Just call 800-474-3531!